This year Snickers launched a quickly-famous campaign, “You’re not you when you’re hungry”, that really came to life with the launch of the Hungerithm algorithm in Australia. The idea behind this ingenious campaign is simple: the angrier Internet goers become, the cheaper the price of a Snickers bar. Data-driven advertising isn’t just for the big dogs. The Amanda Foundation, a nonprofit Animal Rescue, uses demographics and browser history data to introduce animals in need to potential owners via programmatic banner ads. For example, bookworms might be matched to cats, whereas outdoorsy folks might be introduced to an athletic pup. 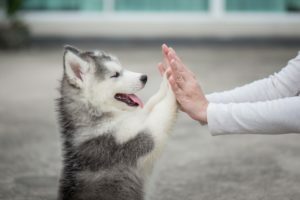 This heartfelt, data-driven campaign not only saves the lives of furry little ones, but it also brings together families based on common interests. Besides being the number one video on YouTube in March 2016 and racking up 51 million views, Always’ Girl Emojis campaign inspired real change. After hearing the voices of real girls and viewing discouraging stats, such as that 72% of young women feel society limits them with preconceived ideas of what they can and can’t do, companies like Unicode Project and Google were inspired by the campaign that resulted in the promise of the launch of new emojis representing professional women. Not only that, but the campaign caught the eye of, and gained support from, major influencers such as Former First Lady, Michelle Obama, and Women’s Rights Activist, Emma Watson. Together with the hashtag, #LikeAGirl, Always set out to encourage and empower young women. If Sainsbury’s heartwarming Christmas tale doesn’t pull at your heartstrings, a look at what they did with the success of this campaign certainly will. In partnership with author Judith Kerr, and HarperCollins Children’s Books, Sainsbury published a children’s book encouraging parents to spend more time with their young ones using the hashtag #ChristmasIsForSharing. The campaign received 30 Million views and raised $1.8 Million for a meaningful cause. All proceeds from the book sales were given directly to Save the Children’s UK literacy programs. Thanks 2016, It’s been weird. 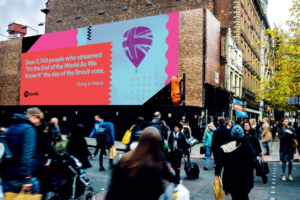 This data shares some peculiar insights into the emotions felt around the world, such as the “Dear 3,749 people who streamed “It’s the End of the World As We Know It” the day of the Brexit vote, Hang in there”. The user data was gathered from 164 localized data stories and was ultimately shared more than 669,000 times on Social Media. The ads were met with such enthusiasm that Spotify subscriptions met a record high upon their release last December. We’d love to hear from you! What’s your strategy for planning a stellar marketing campaign? Learn how Sweetspot empowers marketers to turn their Big Data into useful data!